Danish scientists aim to better understand whether life can survive on Mars by subjecting terrestrial bugs to conditions present on the Red Planet. They are using a "biochamber" to simulate the temperature, radiation and chemical environment found on Mars. The University of Aarhus work will study how whole communities of microbes respond at different soil depths. The data could help future missions to Mars by indicating where life is most likely to survive beneath the surface. "We can get an idea about whether there are organisms that are at all able to survive these conditions," Aarhus researcher Dr Kai Finster told BBC News Online. "If we see that terrestrial organisms are dead within a couple of months, then it's probably not these types of organisms that we have to look for. "Another important question is: which ecological niches do they live in? From [the Viking landings] we know it's probably not the surface - we probably have to dig down beneath it. "For that, we think it would be very important to know whether you have to dig 20cm into the soil or 20m into the soil." The team hopes to provide some clues to this by investigating the effects of simulated Mars conditions on the bacteria at different soil depths. 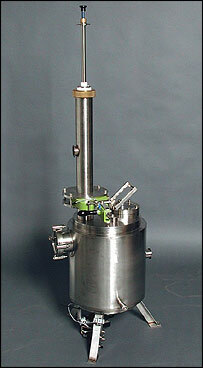 The 40cm-high sealed biochamber allows scientists to control pressure, temperature, gas composition and radiation. The team is using microbial samples from forest soil outside Aarhus in Denmark and from permafrost obtained in Spitsbergen, Norway. The biochamber contains glass tubes to house the microbial samples. These tubes can be added or withdrawn without disturbing ongoing experiments using a special "lock" mechanism. The chamber can be cooled to -60C to simulate the freezing temperatures on the surface and a quartz window allows ultraviolet light to be shone on the samples. 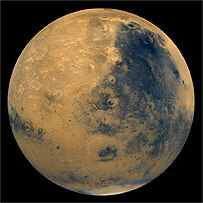 "Martian levels of UV radiation can produce very reactive gases that can diffuse into the very dry soil. There is the possibility that ozone could be formed and even at low concentrations, this can have a sterilising effect," Dr Finster explained. "Even though the UV radiation is only active at the top, the products of this radiation can go down into the soil and affect microbial communities." Dr Finster said that so-called gram positive bacteria - including a group known as bacilla that are abundant in forest soil - were proving the most resistant in the proxy Martian environment. He added that few studies of this type had been carried out because anaerobic bacteria - microbes that do not use oxygen to convert energy - are difficult to handle. In the past, interest has focussed on the bacterium Deinococcus radiodurans, which can withstand several thousand times the lethal dose of radiation for humans. In an attempt to explain its astonishing resistance, a group of Russian researchers has even suggested that Deinococcus may have evolved on Mars. The work is a collaboration between researchers and students from the geology, astronomy and biology departments of the University of Aarhus. Preliminary details of the Aarhus research will be unveiled at the Bioastronomy 2004: Habitable Worlds conference in Reykjavik, Iceland, on 14 July.